It was barely 5 in the morning, we emerged groggily from our green jeep after a bumpy uphill ride from. 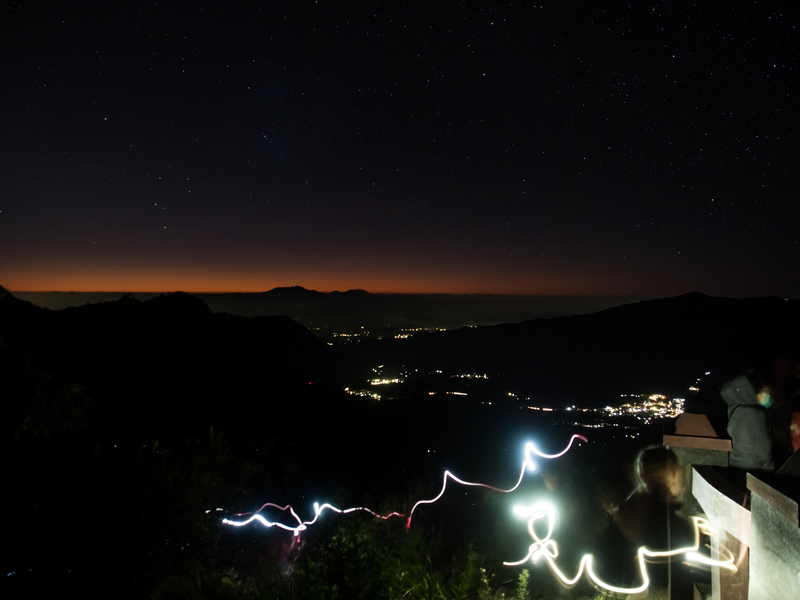 With the faint portable light to guide us, we made the short walk to the lookout point. We thought we were early but there were many others who were already gathered in mountaineer clothing and waiting for first light. Our fleeces and hoodies felt inadequate. The sky was clear and with it brought strong cold winds that pierced through our apparel. “Who said it wasn’t going to be cold?” the blame game started as struggled to rub our arms to keep warm. Shivering, we waited patiently. 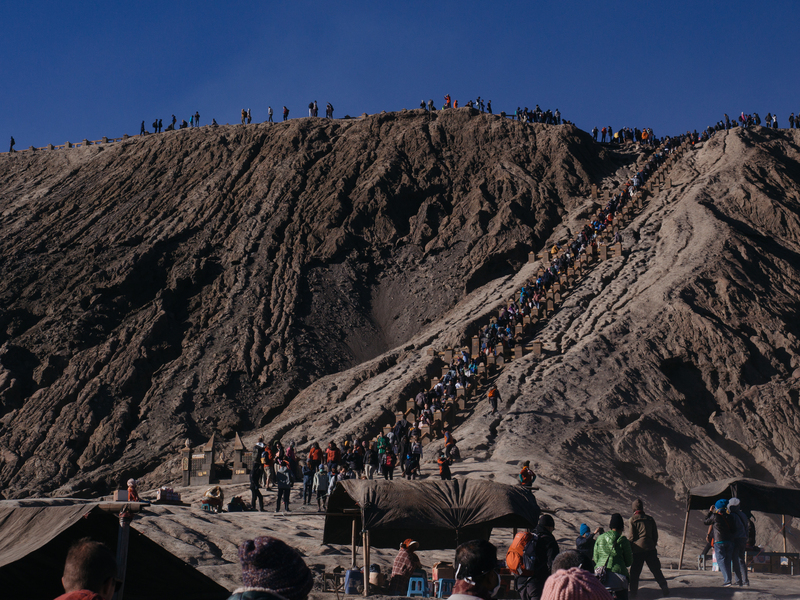 We were at one of Java’s most popular attractions: the Bromo-Tengger-Semeru National Park. 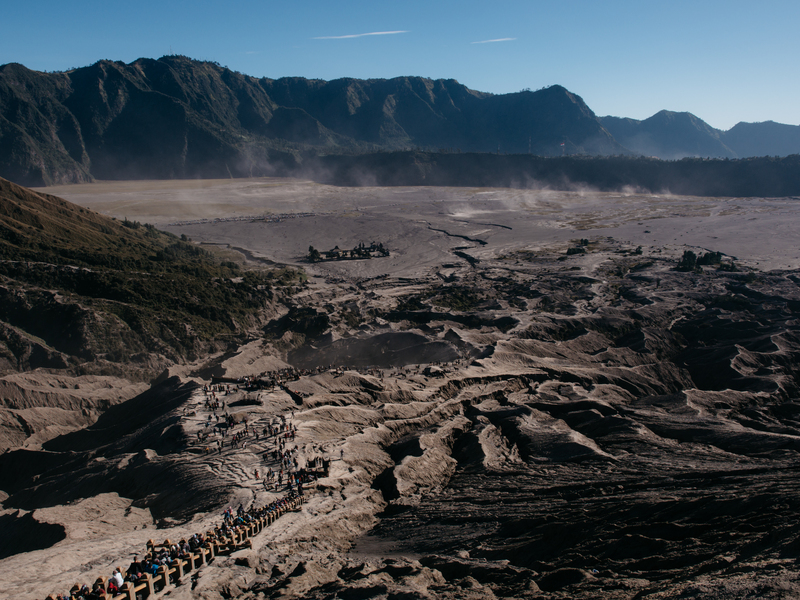 Indonesia sits on the meeting points of several major tectonic plates and is home to many active volcanoes. 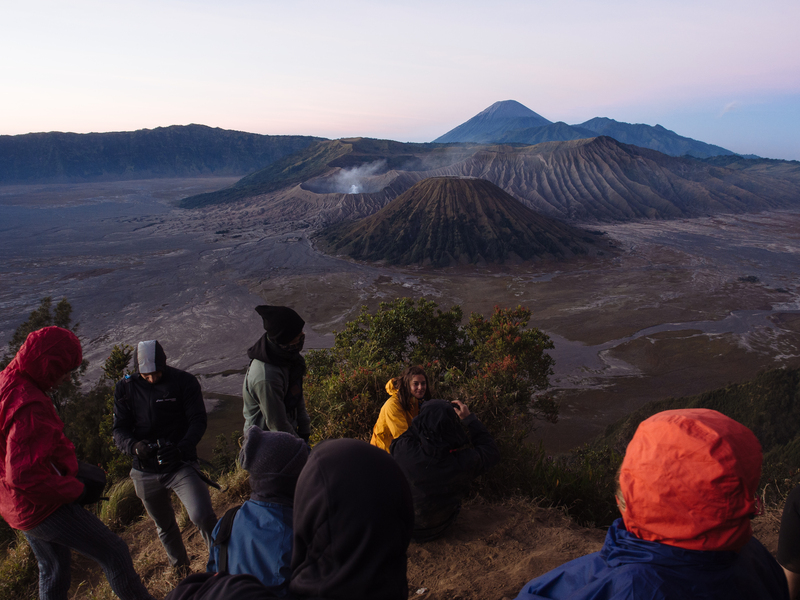 It is named after its 2 volcanoes – Mt.Bromo & Mt.Semeru, both of which are still active with Bromo last erupting as recent as 2015. 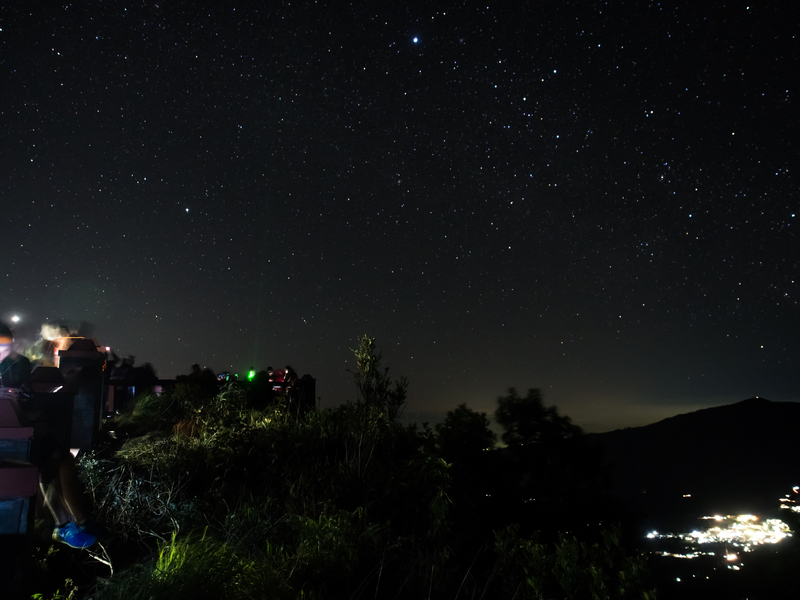 The clear skies brought cold winds but it also great for stargazing. With the milky way and its millions of stars shining clear in the sky, it was one of the most beautiful skies I’ve seen. I took my camera and looked for nearby wooden railing to take long exposure shots. It’s not easy to nail these shots without a tripod, but with a night like this, it’s worth a try. It helped to kill time as well. 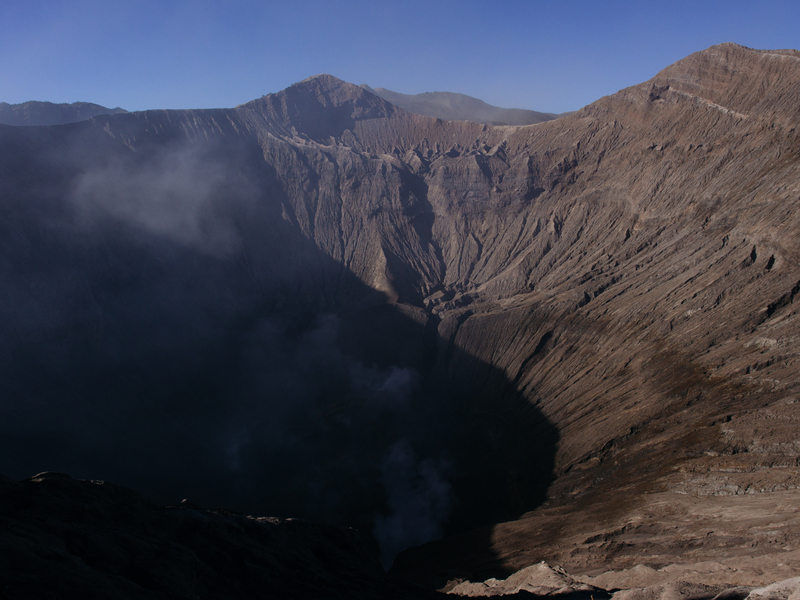 The crater on the far left is Mount Bromo. The one that we would later hike onto. Then, as the sunlight slowly flooded the horizon in blood orange, the stars faded, giving way to a new scene. The silhouette of the volcanoes emerged from the dark and glowed a golden brown hue. They were surrounded by a moon-like landscape of grey soil. 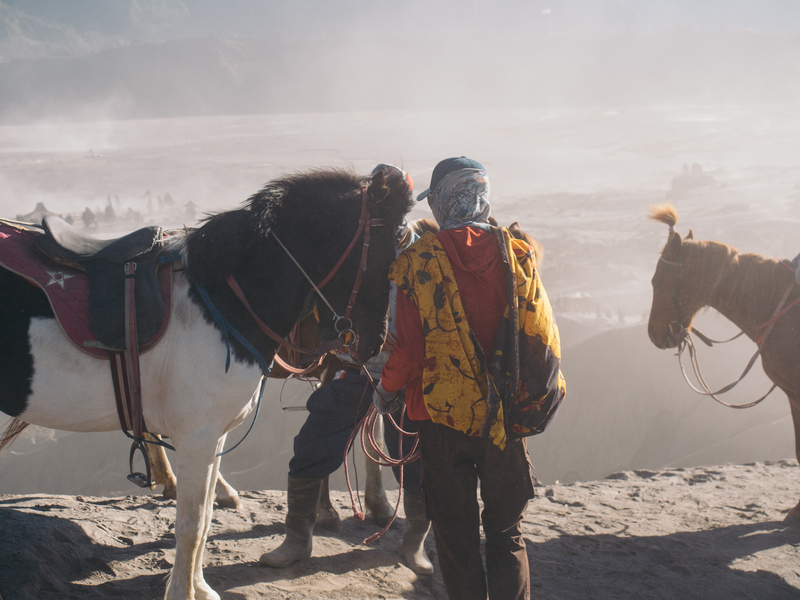 In the background soared the peak of Mount Semeru, the tallest of the group and it is flanked by Mount Bromo, easily identifiable by its emitting smoke. My brother-in-law had their pre-wedding photos taken at the same lookout point few years ago. It’s easy to see why, the panoramic view of the park was stunning. Braving the cold weather was worth it. 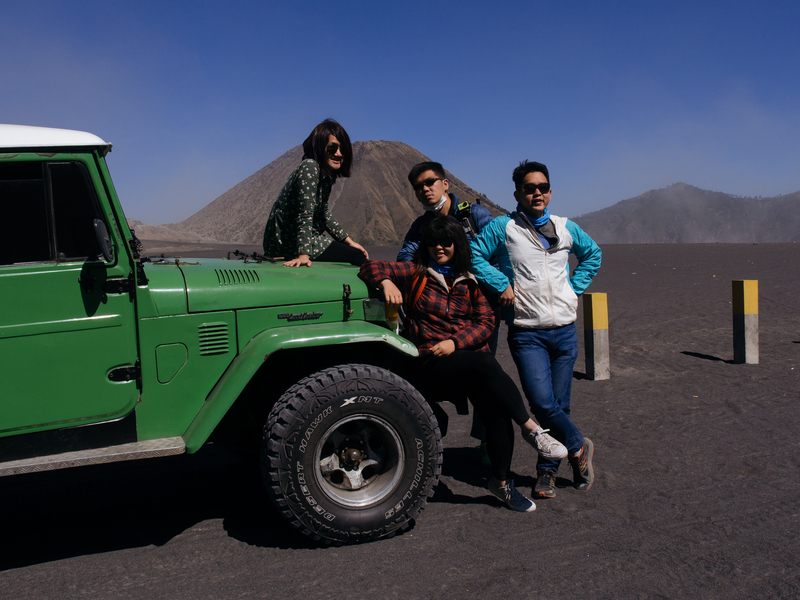 When we were done taking selfies, we hopped back onto the jeep and the driver took us to the foot of Mt.Bromo. Passing through bumpy road as well as misty monochrome backdrop, we might as well as been on a desert on Mars. Once we arrived at the parking bay, we switched to horseback to get to the stairs. 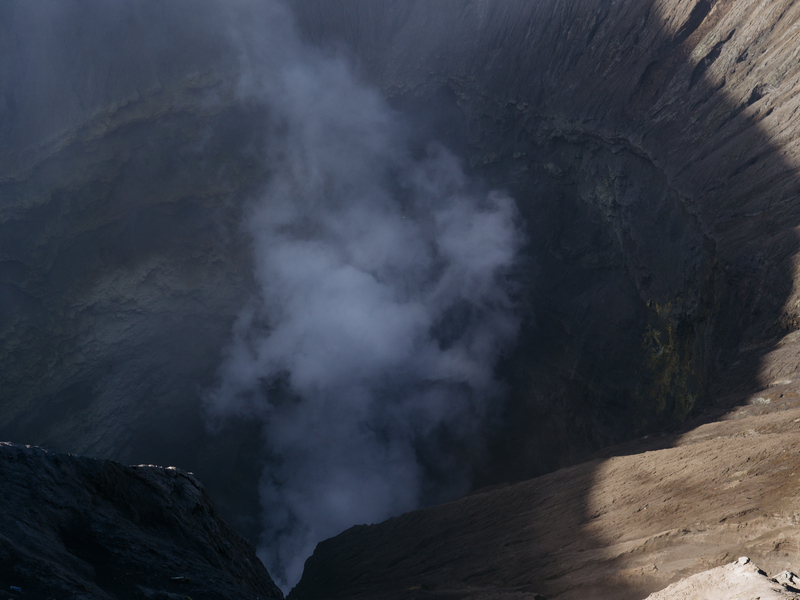 Then on foot, we walked the stairs to the top of the crater. We were standing literally next to the vent, where smoke was emitting. There were little if any safety infrastructure on the crater. No railings to prevent visitors from falling either side of the metre-wide walkway. I guess, it doesn’t make sense to rebuild them after every eruption. It’s a miracle no accident has occurred as considering the size of the crowd and I suspect it’s because everyone is aware of the gruesome consequences. Fall outside of the crater, and you’ll be rolling down hill until every bone gives way; Fall into the crater and it’s a one way ticket into the black hole. A distant but loud growl could be heard from the vent, as if tonnes of rocks are being crushed into one other. It’s hell down there alright. With visitors still coming up in numbers, we didn’t linger for long. We escaped to much safer grounds nearby. 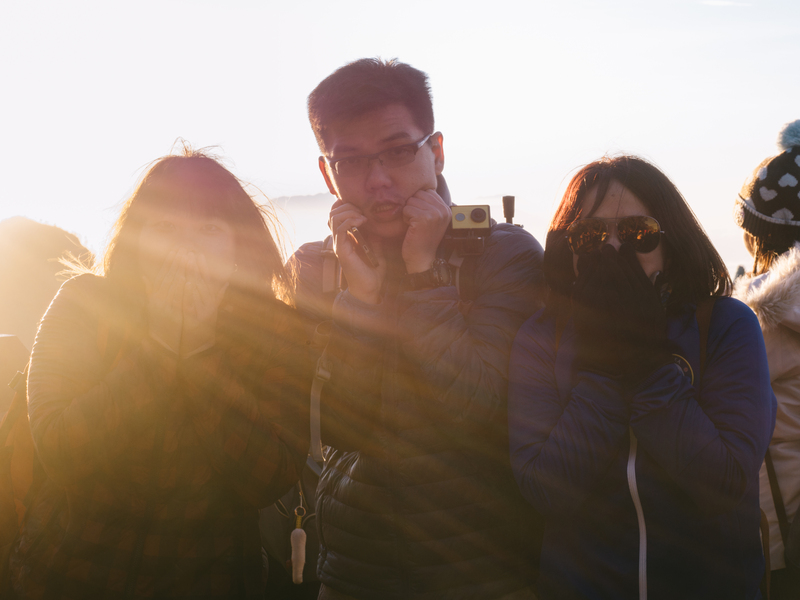 By now, the weather has warmed up and we had fun taking photos and selfies with the moon-like backdrop. Still, even from a distance we could still hear the faint hum from the crater. This is mother nature at her best, constantly reminding us the power of destruction she could bring. It was humbling yet beautiful. 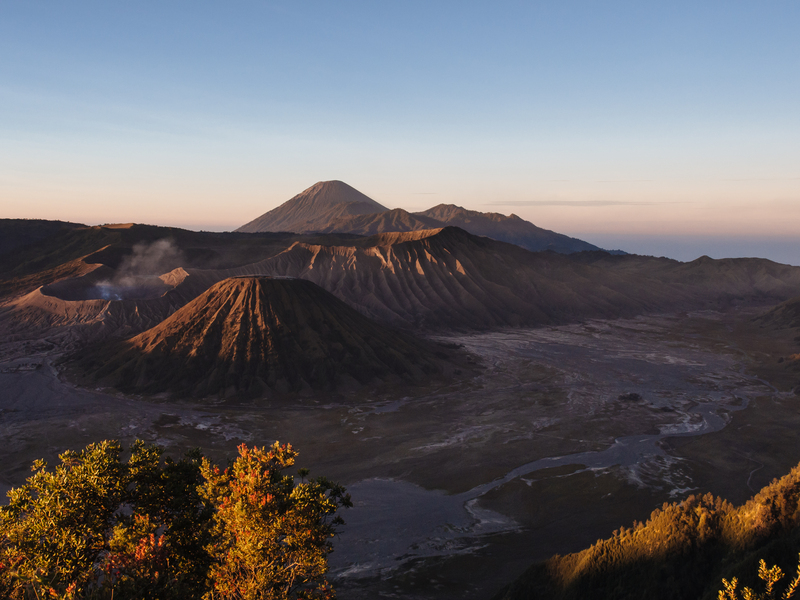 Bromo-Tengger-Semeru National Park is situated in East Java island of Indonesia. You could base yourself at the city of Malang, about 100km south of Surabaya. To get to the national park, it’s recommended that you hire a driver-guide and a jeep for a sunrise tour. The good news is, zero hiking is required for sunrise viewing (Although there are plenty of hiking options around) but this also means it’s crowded all-year. There are a few lookout point, some more popular than others, ask your guide for the best spot with the lesser crowd. 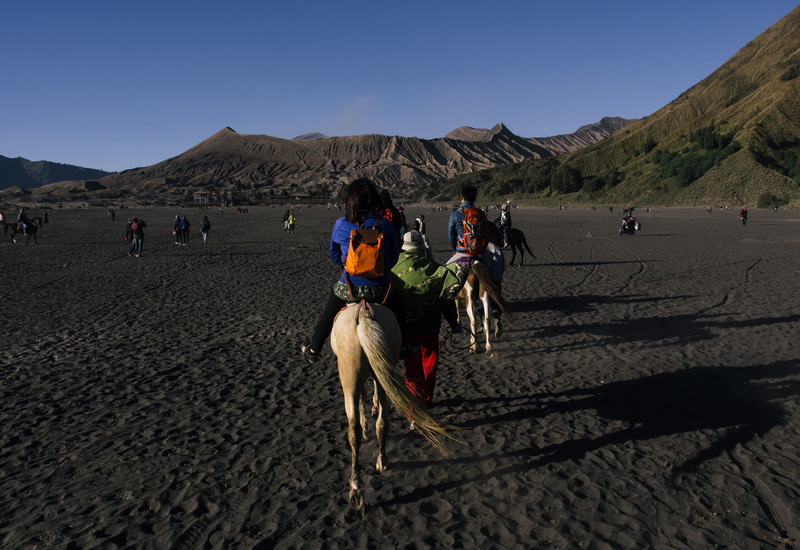 After sunrise, riding a horse to the foot of the crater is fun but not necessary, it is walk-able. We hired a drive-guide for a few days where we started from Malang and headed eastwards towards the edge of Java, where we took the ferry to Bali. If you need the guide’s contact, feel free to drop me a message. Also if you’re in Malang/Bromo region, I highly recommend visiting Madakaripura Waterfall too. It is stunning.